So – what is this #OneWeek100People2017 all about? Is it a race? A stunt? A kind of monastic self-flagellation? Or just an excuse to get out and have fun drawing? Well, why not all of the above! The sketches that follow are from an afternoon at the Montreal Beaux Arts museum. Our USK:MTL club was there to check out a newly opened wing of the museum, and take in an exhibition of work by Marc Chagall. My favorite things were his rough designs for opera costumes. Which have been reproduced as actual garments displayed on mannequins. I didn’t count these (above center) as part of my people sketches. The show was packed! But that was a plus for me. I sat myself down beside one of the informational panels and just dropped into the zone – sketching the endless stream of people stopping to read. Ever since “going pro” as a sketcher, ironically, I don’t get to draw for fun as often as I’d like. I mean – I make sure everything I draw is fun. I’ve learned to stay away from jobs I don’t enjoy. But still – sketching for a client or sketching for a publication isn’t quite the same as drawing for pleasure. This project is a way to put fun back onto the menu. I’ve booked five days off – even if it means short-cutting my paying work! I think, an artist should do this kind of thing every few months. You need to keep the passion for art alive. For me, that means drawing for the simple enjoyment, and detaching from ‘good or bad’, ‘success or failure’. You need to plant the seeds of your own artistic progress. If I’m trying to win a competition or publish a drawing, then I need to hold myself back. Play it safe, so the drawing turns out in a pleasant way. I end up carefully planning, measuring my drawings, practically seizing up with concern that it turns out right. That’s the beauty of this 100 person goal. This sprint to the finish. Now I have an excuse. Clock’s ticking! I get to say screw all that and just draw without consequence. Completely instinctively. I haven’t gone out with this ultra-light sketching kit for ages. I’m using a home-made accordion booklet, and two pens. An ultra-fine Platinum Carbon pen and a Kuretake #13 brush pen. (*affiliate links, thanks). I’d forgotten how fun it is to limit your options. When you only bring the bare minimum for drawing tools, you can’t get bogged down in technical concerns. One of my weird personal goals is ‘fluency’. The ability to throw down a line and have it say exactly what I want. I’m prepared to invest a great deal of effort in the illusion that it’s effortless :) Don’t ask me why this became a goal. I guess it’s just when you see some amazing artist and you say “How the hell did they do that?!?”. 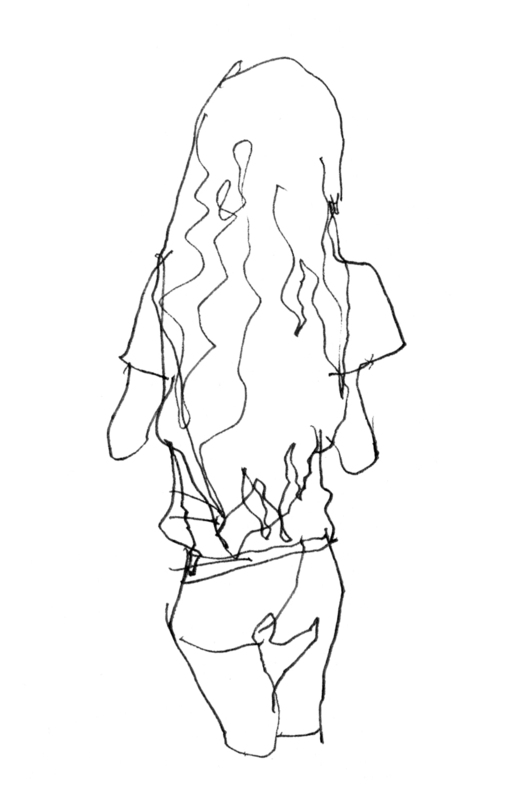 I like it when I look at my own drawings and have that feeling. 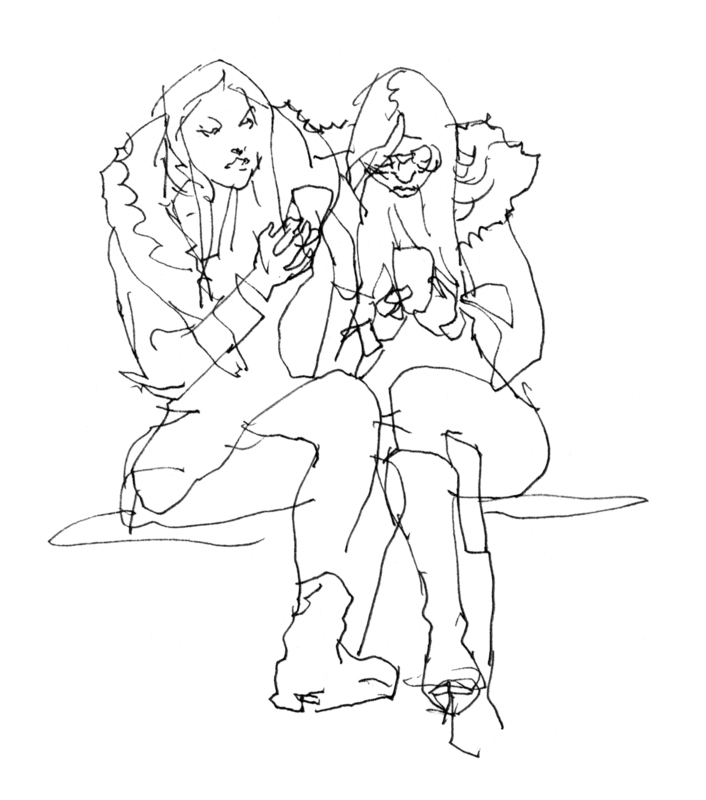 We’ve said this project calls for sketching 20 people a day to hit the goal. I was having so much fun, I finished 100 people in about 4 hours. 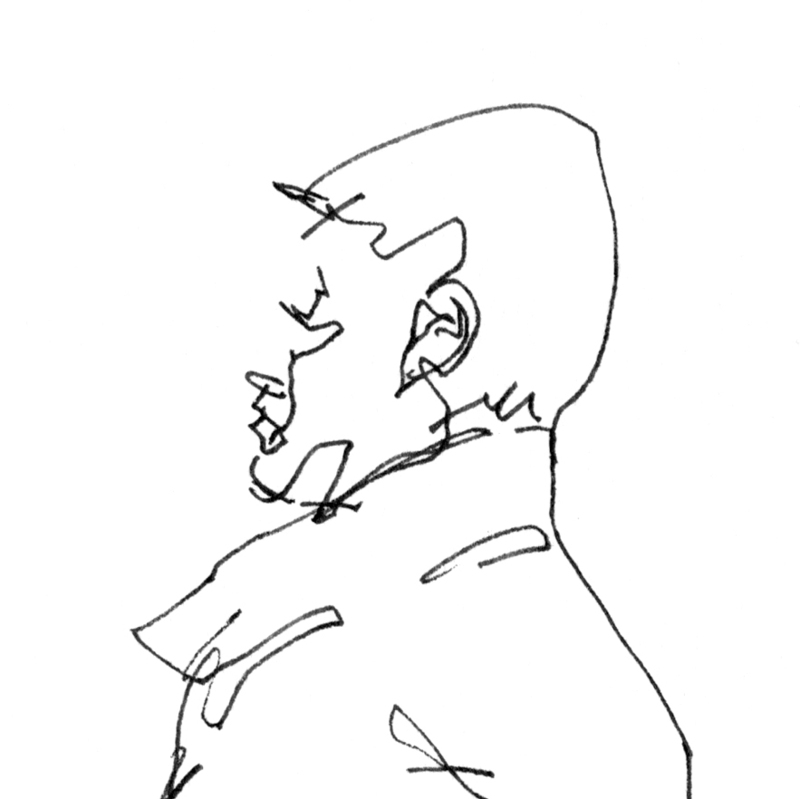 That makes these 2.5 minute gesture drawings (on average). So for those of you worrying that this challenge is too ambitious – here’s my simple solution! Limit yourself to the most basic tools. You don’t even need the brush pen. Swear to yourself you will not judge your work. 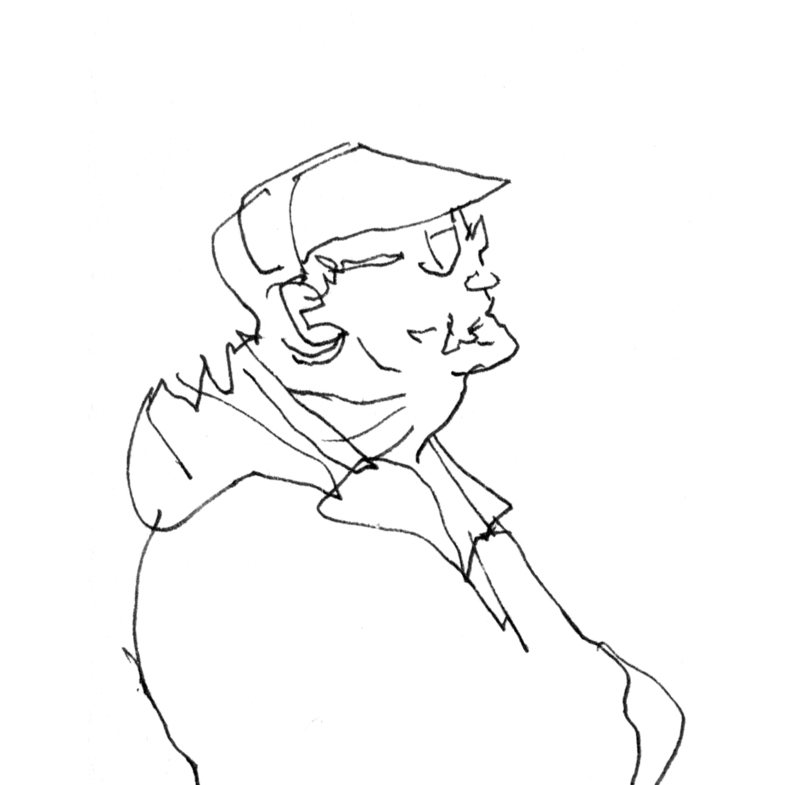 Find a spot with a big crowd of people, and just do 2 minute gestures for an entire afternoon. Anyone can accomplish this! Your gestures may not look like mine – but that’s just a matter of hand skills. And if somehow you can’t see the gems (you’ll see them later when you look back!) at least you can assure yourself you’ve put in some miles towards your goal. You’re moving the progress bar. Leveling up your skills with every drawing. So now that I’ve hit the week’s goal of 100 people – I can spend the rest of the week truly playing. I honestly don’t even know yet. I’ll be taking this one day at a time. Your sketches are very inspiring. I’ve tried to talk myself out of this challenge but have decided to dive in. I’m headed to the public library where I hope nobody notices what I’m doing . . . Perfect spot! The library is ideal. I was surprised last year how easy it was in the bookstore too. Readers are easy targets! Thank you – I will be doing this. :P I’m excited.Quick sketching is one of most favorite things to do. I decided to try this out and the museum is a great idea. I’m taking your advice to go light and fast. Thanks! Marc, I love this post, inspiring, I am heading for the coffe shop and library, 20 here I come! Thanks for the encouragement! 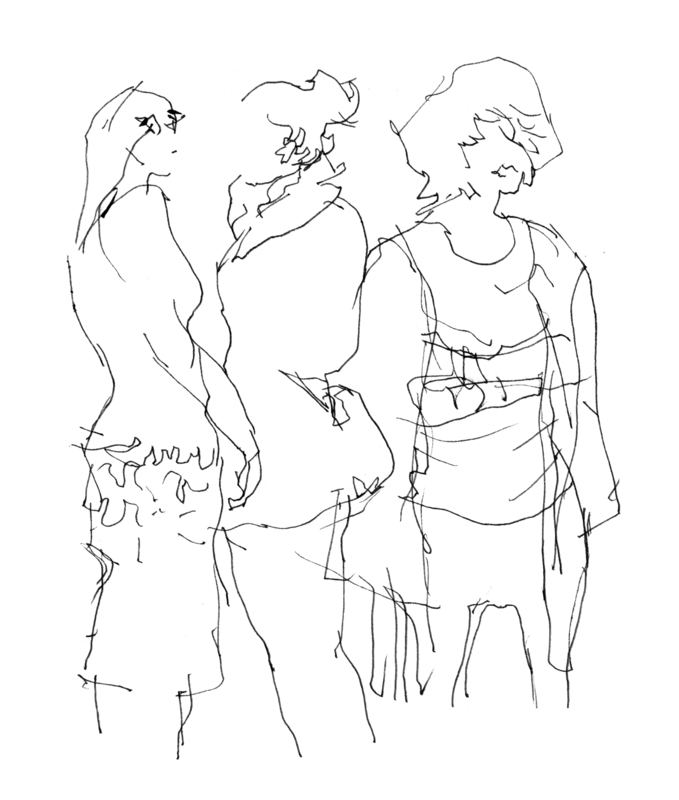 I signed up for your Sketching People in Motion class and watched all the sessions in one go! What a wonderful class, I learned so many new ways to sketch and how to get away from my sketches being static. Marc, I love this post also. I was hesitating in joining, thought it would just take up too much of my time, having just come off of the Opus Daily Practice challenge, but you have inspired me with your tale. Your approach to having fun is just the thing I needed to hear this morning. Thank you! Here I go. I am newat this and have made 100 portraits (small ones) out of a fashion magazine. i was surprised by the character That appeared on my paper!!! Fun!!! It Is fun to just let go, let the pen expressed, Thanks for the tips…. Marc, great inspirational post. I think you have achieved your goal of fluency. I was looking at your sketches before I read you had written and I was thinking, “Wow, every line has a purpose. How does he do that?” Thanks for sharing your talent. Wow ! Marc ! Really great! Thanks for the tips. I live outside a village, not easy to find people to draw. More birds than persons. But next week, I’ll have a perfect spot. I’ll be one week later,… or 51 weeks in advance ! Great sketches! You must have really been in the zone. I went out with just my sketchbook and a pentel brush pen. That made it impossible for me to do a lot of details. Have been having a lot of fun with the challenge … 100 seems like so many, but when most of them are quick 2-minute-ish captures, it’s not bad at all.